We went to the Stern Grove Festival today and I can't believe that it took us 3 years in San Francisco to even hear about these events! 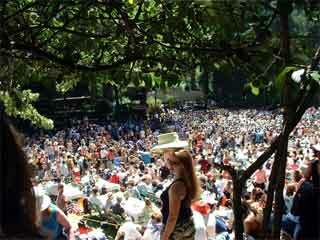 The venue for these concerts is a deep valley in a park in the south-western part of San Francisco and the stage area is surrounded by huge redwoods and eucalyptus trees. It's a beautiful setting for these concerts and even better - it's free!